Concrete walkways, porches and patios are common in the yards of Lehigh Valley homes. Whether you want to spruce up existing outdoor areas or add new ones, think about environmental impact before you begin. Two area suppliers and contractors gave us tips on how to add curb and use appeal to your property without using up scarce natural resources or adding debris to our overburdened landfills. If you’re adding a new walkway, poolside deck, patio, steps or other hardscaping, check out some of the new, man-made materials before you begin. Pavers made of sand, cement, aggregates, limestone and pigment come in many colors, shapes and sizes, according to John Zuber, owner of AB Natural Stone. While quarrying clears off topsoil and natural stone, creating scars on the landscape, it also uses more energy and is more labor-intensive than man-made products. “Not only is the process of making these pavers more environmentally friendly than quarrying, but pavers can also help cut down on water run-off,” he explains. How? Some of them are more permeable than others and can be laid on loose crushed stone instead of on a tight reservoir that doesn’t allow water to be absorbed into the ground. “By containing more water on the property, less goes into storm drains and ultimately streams, keeping the natural environment as clean as possible,” says Zuber. In some areas, regulations dictate how much run-off is allowed, especially in commercial applications where businesses may have to pay a fee for the municipality to handle their run-off. 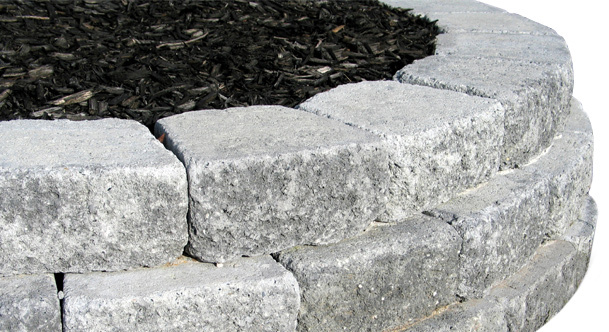 In any case, using any type of paver results in less water run-off than do solid surfaces such as concrete or blacktop. Another consideration is cost. Whereas you may pay about $5.00 a square foot for Pennsylvania blue stone, man-made pavers average about $2.30, Zuber says. One of the brands he carries, Techo-Bloc, is made in a local plant in Pen Argyl. “Pavers are cost-effective, require minimum maintenance and have a long life,” he says, “and come in tumbled, with a softer Old World look, or non-tumbled, which is crisper with a sharper edge for a contemporary look.” There are a myriad of shapes, sizes, colors and textures to choose from for purposes that range from walls to planters to planting bed edges and any other outdoor application. Another long-range advantage of pavers is that they can be pulled up and replaced or repaired when needed. 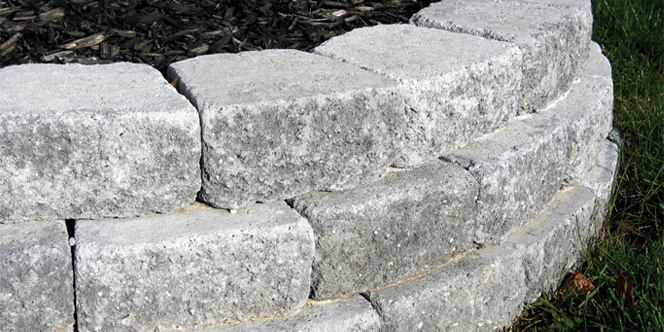 Other green hardscape options include products made of recycled materials, such as rubber, glass, broken concrete from demolition projects and salvaged bricks and stone. Should you decide to use new bricks, try to find them locally made or at least U.S.-made. Bricks from developing countries may have been made in wood-fired kilns (highly polluting) instead of being fueled by natural gas as in the U.S.
Let’s say you have a perfectly good concrete slab porch, patio, pool surround, walkway or driveway. But its bland surface detracts from your home’s overall appeal. Jim Scheetz, owner of Endless Concrete Design, suggests decorative concrete resurfacing or acid staining. At about half the cost of replacement, these methods can resurrect surfaces without using more resources or adding discarded material to landfills. Resurfacing can also visually minimize existing cracks by incorporating them into the design. Existing concrete joints can be merged with new faux grout lines to make them less obvious while still functioning to prevent cracking in the concrete. Spray texture, which adds about 1/8” to the surface, is especially good for pool surrounds and driveways as it makes them more slip-resistant. Acid washing is popular on geometric patios, Scheetz says. “We use a natural metallic salt and muriatic acid solution that can be manipulated to get different shades and effects that look like rich stone.” The only maintenance needed with this method is resealing every three to five years. “Making new cement produces lots of CO² and uses lots of energy,” says Scheetz. So resurfacing is a very green option. Regarding coloring, Scheetz says the pigments used allow for natural-looking color variations. His website shows effects that range from varicolored tile to natural stone to ribbon and design patterns. Another benefit of resurfacing – in addition to cost and environmental impact – is the low ongoing maintenance of concrete compared to other materials. So, before you set out for the closest home improvement store to start a landscaping project, think about options for reusing or adding hardscape that is Earth-friendly as well as use-friendly. There are many sites on the internet that address green landscaping. Greenyour.com and ucdavis.edu were useful in the writing of this article. Inside and out, our “Home” department offers sound, practical advice for every budget, providing the Lehigh Valley’s best resources to get your projects in gear, from start to finish.